* 2013 WPX RTTY Contest Scores now online only. Click here for complete scores. When terrorist bombs went off at the finish line of the 2013 Boston Marathon, ham radio operators were right in the middle of the action, "shadowing" medical officials and helping to get remaining runners off the course and reunited with family and friends. 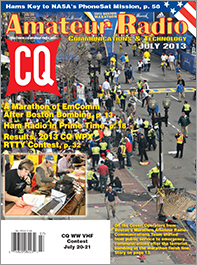 In this month's cover story - "A Marathon of EmComm in the Wake of Tragedy" - Public Service Editor Richard Fisher, KI6SN, and the Marathon Amateur Radio Communication Team recount the many ways in which ham radio operators helped keep communications flowing. Next, "Last Man Standing" TV show producer John Amodeo, NN6JA, takes us behind the scenes on the episode of his program that featured several of the show's characters using amateur radio in "Ham Radio in Prime Time." 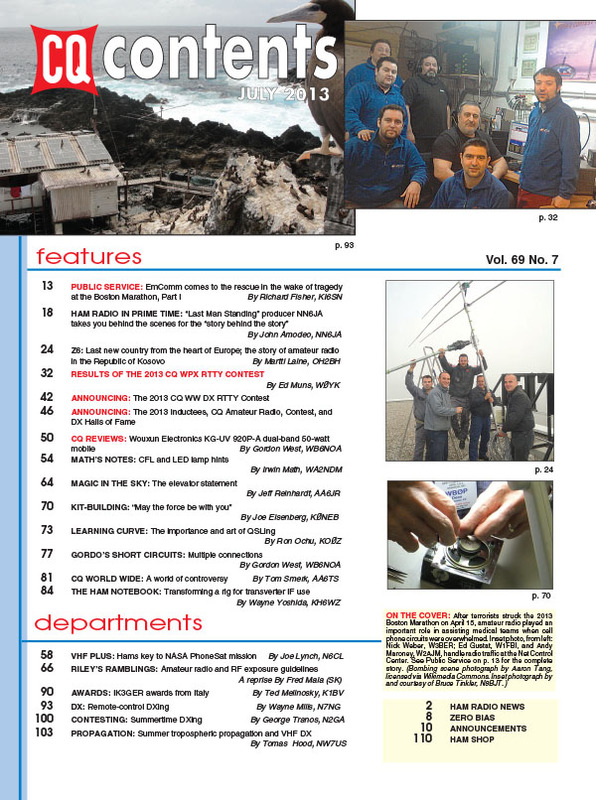 DXpeditioner extraordinaire Martti Laine, OH2BH, tells the story of the rebirth of amateur radio in the Republic of Kosovo in his article, "Z6: Last New Country from the Heart of Europe." Martti'spiece is particularly timely since Kosovo and Serbia (from which it broke away in 2008) recently announced an agreement on normalizing relations that is expected to result in both countries being admitted to the European Union. Once Serbia recognizes Kosovo, Martti wonders, how much longer will it be before the ARRL does as well? Next, we have the results of the 2013 CQ WPX RTTY Contest, which saw a 13% increase in active callsigns, following a 25% increase the previous year. We also continue our ongoing realignment of contest results reporting by publishing the complete score listing online only, beginning with this contest. Click here to see the complete scores. We also have the rules for the 2013 CQ World Wide RTTY DX Contest , coming up this September. As we do each July, we introduce the newest members of the various CQ Halls of Fame. We have eight new inductees this year to the CQ Amateur Radio Hall of Fame, and two new members each of the CQ Contest and DX Halls of Fame. Finally among our features this month, Contributing Editor Gordon West, WB6NOA, conducts a CQ Review of Wouxun Electronics' new 50-watt dual-band mobile rig, the KG-UV 920P-A. He gives it very good grades, as long as you get the software to program the memories with your computer. 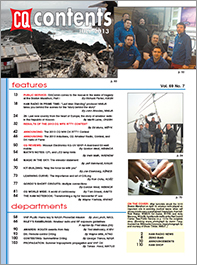 Among this month's columns, "Math's Notes" editor Irwin Math, WA2NDM, offers hints on working with CFL (compact fluorescent) and LED lamps; "VHF-Plus" editor Joe Lynch, N6CL, reports on the key role hams played in collecting and assembling data for NASA's PhoneSat mission; and "Magic in the Sky" editor Jeff Reinhardt, AA6JR, discusses the challenge of creating an "elevator statement" to briefly describe today's ham radio to non-hams. In this month's "Riley's Ramblings" column, we reprise a 2004 "Washington Readout" column by the late Fred Maia, W5YI, on amateur radio and the FCC's RF exposure guidelines, since the Commission says it's going to re-evaluate its current rules, including those that apply to amateur radio. Kit-Building Editor Joe Eisenberg, K0NEB, looks at the 4S-Link digital mode interface kit from the Four States QRP Group; "Learning Curve" editor Ron Ochu, KO0Z, discusses "the importance and art of QSLing;" "Gordo's Short Circuits" editor Gordon West, WB6NOA, looks at a couple of products designed to help you make multiple connections - one for antennas and the other for DC power - and International Editor Tom Smerk, AA6TS, examines ham radio-related controversies in New Zealand and Australia, as well as less-controversial topics, such as a European youth radio camp and a special event station commemorating the 250th anniversary of a church bell tower in Portugal. "Ham Notebook" editor Wayne Yoshida, KH6WZ, looks at transforming a basic ham rig for use as a transverter "IF" to get you on the microwave bands; Awards Editor Ted Melinosky, K1BV, reports on a series of awards sponsored by a single individual in Italy; DX Editor Wayne Mills, N7NG, writes about "remote-control DXing," Contesting Editor George Tranos, N2GA, looks at summertime contesting opportunities and Propagation Editor Tomas Hood, NW7US, joins the summertime theme with a look at tropospheric propagation ("Tropo") and DX opportunities on VHF. That's a brief look at what's coming up in the July issue of CQ magazine. 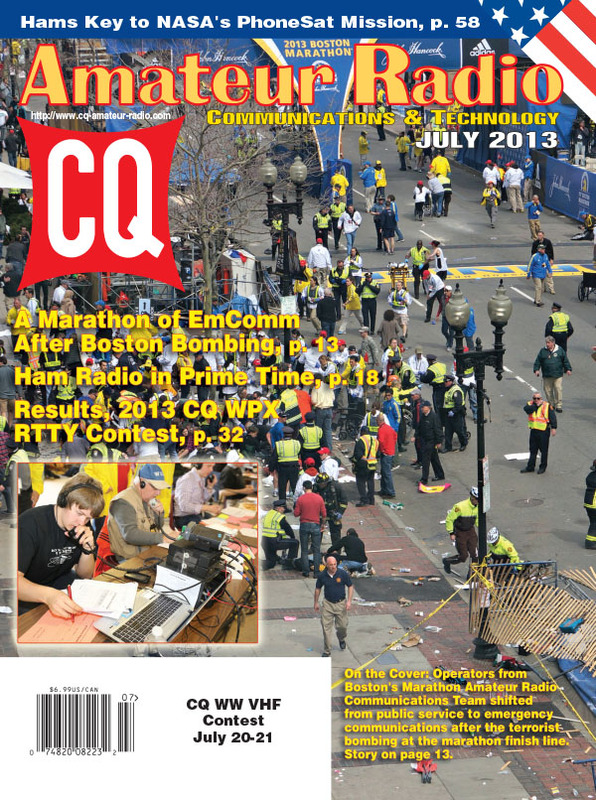 For information on becoming a CQ subscriber - to either our print or digital edition (or both!) - click here! Zero Bias - "(Parking) Field of Dreams"